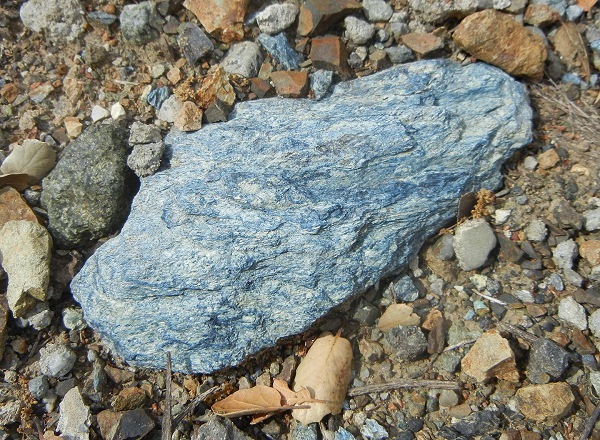 It may seem like I have a fixation on blueschist. I’ll admit that. I have a fixation on every rock type. 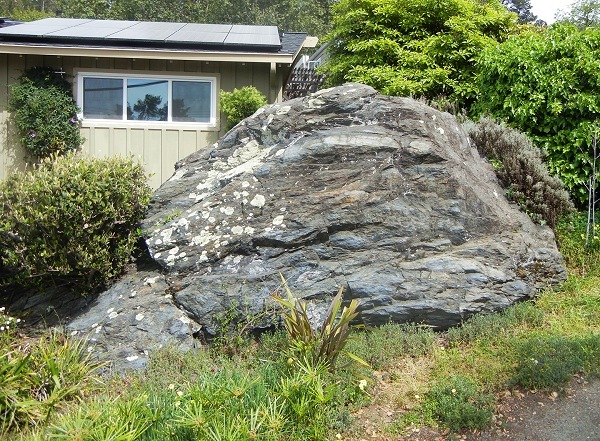 Here’s a fine blueschist boulder at the very north end of Castle Drive, in the Piedmont Pines neighborhood. This qualifies as a knocker, and it also qualifies as a high-grade block. “Knocker” is local geologists’ slang for a small block of resistant rock that protrudes out of an area of melange (like those in Mountain View Cemetery that I feature here in the “cemetery knockers” category). By default that’s understood to mean Franciscan melange, because melangea collection of geological bric-a-brac mixed in a matrix of shalepractically defines the Franciscan complex. However this high-grade block is in the serpentinite patch, part of the Coast Range ophiolite, which also qualifies as melange. 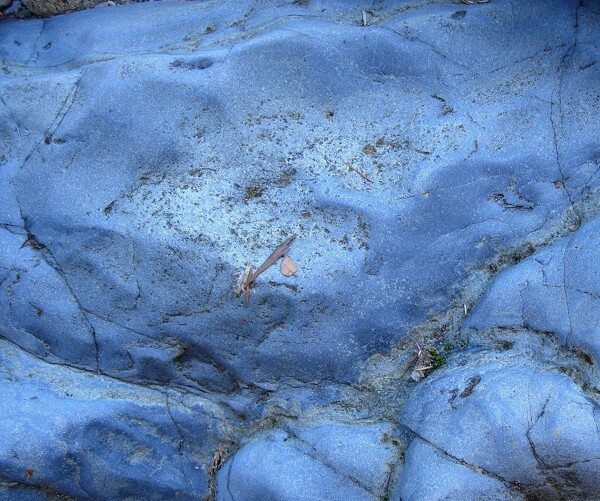 Oakland’s serpentine patch contains a goodly share of blueschist. This is a piece of it near Redwood Road that was lying right next to a piece of classic serpentinite. The key indicator for me is the color, which is typical of the mineral glaucophane. Glaucophane is described as various shades of blue, while serpentine is described as varous shades of green. They differ in their luster and hardness as well. My gold standard is the classic occurrence at Ward Creek near Cazadero, which I visited in 2005. Here are two photos from there. So glaucophane tends to a dusky, blue-jean blue or gray-blue. Green minerals like chlorite, epidote and omphacite may accompany it as they do here. Serpentinite doesn’t change much with pressure. It’s a cryptic rock that doesn’t retain many traces of its history. 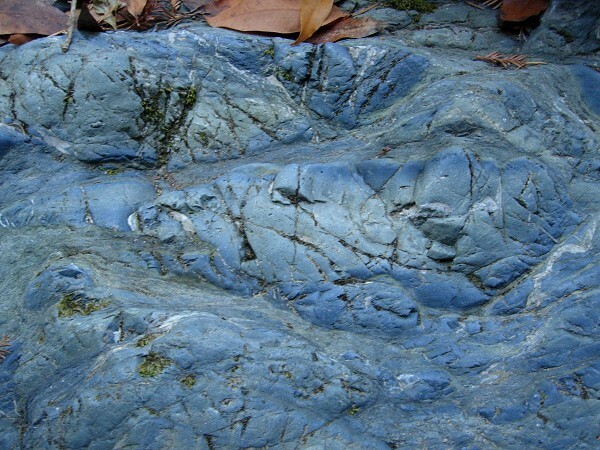 But the blueschist that accompanies it in the Oakland serpentine patch testifies to fast, deep burial and equally rapid exhumation. This entry was posted on 22 June 2015 at 8:02 am and is filed under Oakland blueschist. You can follow any responses to this entry through the RSS 2.0 feed. You can skip to the end and leave a response. Pinging is currently not allowed.